The electric guitar has been basic to rock and roll ever since the beginning. And while singers usually take the spotlight, the music has created plenty of guitar heroes. So another phenomenon going back to rock's early days has been instrumental recordings spotlighting the guitar. This week we have an album that continues the great tradition of instrumental rock guitar, looking to the past for inspiration while highlighting the level of musicianship more typical of today's best players. 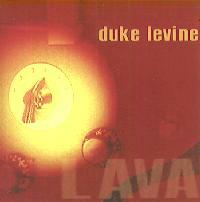 It's the latest recording by Boston-area guitarist Duke Levine entitled Lava. Like many of the fretmen who preceded him in the instrumental rock legacy, Levine is best-known for accompanying others, having recorded on each of the albums by the folk duo The Story, plus singer-songwriters Ellis Paul and Carol Noonan and guesting with the band the Del Fuegos. Since 1995, Levine has been a part of Mary Chapin Carpenter's touring and recording band, winning a lot of recognition for his work with her. He has also been active as a studio musician including work on soundtracks to various films. When it comes time for studio guitarists to make their own records, the best ones tend to refrain from using it as an opportunity to show of their hot licks and technical prowess. Instead, some will make a album that tends to run toward the more serious compositional approach, while others will make a recording that is just good fun, while including some interesting licks for guitarophiles to discover when they listen carefully. The latter is the approach taken by Levine, on this, his third solo release. It is reminiscent of the Hellecasters, the trio of studio guitar mavens from the West Coast. There is a bit of twang, including some nods to guitar pioneers like Duane Eddy, plus some country-style, a little rockabilly, some Byrds/folk-rock style jangly 12-string guitar, and even a take-off on the soundtracks to the old spaghetti Westerns. And like the Hellecasters' albums, there's a spirit of good fun that runs through Lava, from the humorous little guitar noises he injects here and there, to the infectious beat and the way he does cover tunes in unexpected ways. The result is a great album that runs toward the lighthearted in sound, but features some very tasteful and occasionally tricky musicianship. And with the revival of interest in venerable styles in rock, the album might well appeal even to those trend-surfers looking for something cleverly retro. Joining Levine are members of a band with whom he regularly works, bassist Paul Bryan, organist Tom West, and drummer Lorne Entress. Guests include two of the members of the idiosyncratic alternative band Morphine. Though he is known on record for his tasteful, folky guitar that has helped to define a kind of new singer-songwriter style, for this album Levine definitely looks back to the styles originated by the rock guitar pioneers while adding his own distinctive twist. He takes a lot of different approaches on the album, but no style that's less than about 25 years old. In addition to his electric guitar, he also plays some acoustic rhythm, and pedal steel guitar to give the country tunes some added twang. His sense of tradition and good taste come through constantly, while he is not afraid to have a little fun, especially with the cover tunes he does, like his low-down swamp version of Peggy Lee's hit Fever. Duke Levine's new album Lava, is a great instrumental guitar record that you don't have to be a rock guitar fanatic to enjoy. Much of the music, hinting at styles of the past, is downright fun. Some of the tracks are even danceable. But those for whom guitar is a passion will also find much to appreciate in Levine's exceptionally tasteful and often subtle playing and formidable technique that makes what he does sound so effortless. The combination of his nicely-written original pieces, plus his clever treatment of the cover tunes makes for an attractive mix of material. Sonically, the album brings no complaints from me. Levine produced the Lava himself together with film composer and record label-owner Mason Daring, with the bulk of the engineering and mixing by Chris Rival. Though much of the album's music has a retro mood, fortunately, the folks in the control room did not try to duplicate the crummy sound of those old records -- something that has often happened. There's even a fairly decent dynamic range, especially on the more moody-sounding tracks. Retro rock seems to be in, and though versatile guitarist Duke Levine is hardly one to glom onto the latest fad, with some luck, Lava could well find audiences from younger listeners as well as from those whose memory goes back to glory days of rock guitar.